Department of Applied Chemistry and Biochemistry, University for Develpoment Studies, PO Box 24, Navrongo, Ghana. Citation: Boakye M, Mbatchou VC, Khan ME. Protecting Cowpea Seeds (Vigna unguiculata) against Cowpea Weevil (Callosobruchus maculatus) with Unripe Banana Peel Liquid. 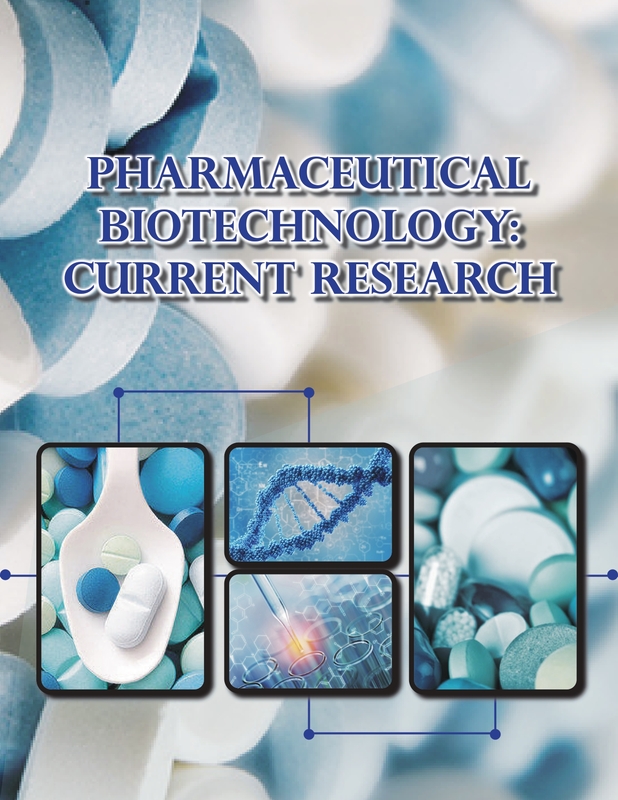 Pharm Biotechnol Curr Res. 2016, 1:1. A laboratory study was conducted to determine the protective effects of unripe banana peel liquid extract on cowpea seeds (Vigna unguiculata) against cowpea weevil (Callosobruchus maculatus). Petroleum ether solvent was employed in the extraction process which yielded the extract (23.71% w/w). Four concentrations (10%, 1%, 0.1% and 0.01% w/v) of the liquid extracts were each mixed with 5 g of cowpea seeds put in plastic vials in triplicate. Each experimental unit had ten pairs of adult Callosobruchus maculatus. The effects of different concentrations of each treatment on insect mortality, weight loss and viability of cowpea seeds were assessed. The highest concentration (10% w/w) induced the highest perentage mortality of C. maculatus. There was a significant difference (P<0.05) in perentage mortality of weevils in the treated and untreated cowpea seeds subjected to weevils. Unripe banana peel liquid extract gave appreciably reduced average percentage weight loss when compared to the untreated seeds (control 2). There was a significant level of weight loss between treated and untreated cowpea seeds (P<0.05). Seeds treated with the highest concentration (10% w/w) of liquid extract showed the least weight loss and was not viable whilst those treated with 1% w/w, 0.1% w/w and 0.01% w/w of liquid extracts were viable, with control 2 having the least percentage viability. Seeds treated with liquid extract at concentration 0.01% w/w prevented infestations by weevil’s larvae, and favoured germination more than seeds which were not treated with liquid extract and also not subjected to weevils but kept for the same duration as the experiments (control 1). Unripe banana peel liquid extract protected cowpea seeds from infestations by the weevil’s larvae. Hence, this research supports the local use of unripe banana peel liquid as a protectant and also reveals the concentration of liquid extract which favours germination of cowpea seeds. Cowpea (Vigna unguiculata) is a leguminous, herbaceous plant which belongs to the family fabaceae. It is cultivated all over the world, especially in Brazil and some African countries and prefers well-drained loamy, sandy soils with slightly acidic to neutral pH ranges of 5.5-6.5 . Cowpea seed is a veritable source of minerals and vitamins such as calcium, thiamine, Vitamin B6 and riboflavin. It contains metals such as iron, magnesium, molybdenum, etc., and is highly consumed by people for its richness in proteins . The major problem facing cowpea seeds storage in African countries are several insect pests including weevils and moths, leading to loss in weight and quality of cowpea seeds. Apart from contamination of grains by dead insects, pupae and larval cocoons, their integument has been found to contain various carcinogenic compounds such as ethyl, methyl and methoxy quinines which cannot be denatured by boiling or baking . The problem of cowpea seed infestation by insect pest is centered on the use of conventional or synthetic insecticides, which are very expensive, deposit toxic residues in food, development of insect resistant strains and they sometimes constitute health hazards to consumers . Scientists estimate that pesticides are reducing crop yield by one-third through impaired nitrogen fixation and for that matter research has projected that pesticides and other contaminants should be substituted by one remarkable mechanism, yield enhancing benefit of well managed, organic farming system. This has necessitated research on the use of alternative eco-friendly insect pest control amongst which are the use of botanicals in controlling insect pests infestation of stored cowpea seeds. The seeds of A. squamosa and A. reticulate contained the alkaloid anonine which has shown insecticidal activity against pulse beetle . Research has revealed that the seed oil of rubber plant has protective effect on cowpea grains against Callosobruchus maculatus. Coconut and palm kernel oils have been applied on cowpea grains to control Callosobruchus maculatus infestation . With the promising results reported on the pretective effect of botanicals on grains against insects, there is the need to also assess unripe banana peel liquid extract for protective effects on cowpea seeds (V. unguiculata) against cowpea weevil (C. maculatus), and its influence on the germination of cowpea seeds. This may support the local use of unripe banana peel liquid extract as a cowpea grain protectant, and clarify it status as a botanical which either promotes or inhibits germination of cowpea seeds. Parent stocks of C. maculatus obtained from cowpea seeds in the store house of Osei Kyeretwie and Simms Senior high schools, Kumasi were reared on disinfested cowpea seeds. Seeds were divided into six parts and placed in kilner jars covered with muslin cloth and held by the sides with expansible rubber bands. Each kilner jar had fifty pairs of C. maculatus which were placed in insects rearing cages at ambient temperature of 27 ± 3°C and relative humidity of 65 ± 8%. Rearing of insects were carried out for a period of thirty days. Fresh, unripe banana fruits, free from pest infestation harvested at random from Mr. Steven Donkor plantation farm in the Ashanti region, Ghana packaged in a perforated paper box, were transported to University for Development Studies, Navrongo Campus, Upper East region, Ghana. The identity of banana plant was confirmed to be Musa paridisiaca at the Botany Unit, Department of Biological Sciences, University for Development Studies. Unripe banana peels were removed from fruits, chopped into pieces, washed with distilled water and ground into small sizes using an electric blender. 350 grm of the milled banana peel sample was weighed, transfered into a 1 litre glass container and 450 mL of petroleum ether solvent was added to the milled material and stirred with a glass rod to ensure movement of the soluble components of the solid material into the solvent phase. Percolation was carried out on 7th day with Whatman No. 1 filter paper. The resultant percolate was air dried at room temperature (25°C) which yielded a liquid extract (23.71% w/w) that was kept in a refrigerator at the temperature of -10°C until analysis. The acidity or alkalinity of unripe banana peel liquid extract at different concentrations was confirmed by subjecting the sample to pH analysis using Crisson pH meter. Wavelengths of absorbance were obtained by scanning liquid extract in an SM22 PC Spectrophotometer (340-1000 nm). Cowpea seeds purchased from Navrongo market in the Upper East Region of Ghana were deprived of foreign materials and kept in a refrgerator at the temperature of -10°C for a period of 7 days. The disinfested seeds were exposed at room temperature in the laboratory to prevent moulding, and then kept in an oven at the temperature of 40°C for a period of three hours and allowed to cool before treatment with unripe banana peel liquid extract. On the seventh day of the mortality experiment for cowpea weevils, weighing of treated and untreated grains began until the 30th day when adults emerged from cowpea seeds. The masses of treated and untreated seeds were taken, and the number of undamaged and damaged seeds (seeds with characteristic holes) were also taken. At the end of day 30, dust, frass and any insects present in the seeds were removed from the content of each container. The seeds were re-weighed and percentage weight loss was calculated. Where Wi is initial weight, Wf is the final weight of sample. The viability of cowpea seeds treated with unripe banana peel liquid extract at concentrations 8.3 g/mL, 0.83 g/mL, 0.083 g/mL and 0.0083 g/mL, and the controls 1 and 2, subjected to both the weevil mortality and seed damage assessment experiments were tested for a period of five days. Control 1 comprised of non-treated cowpea seeds not subjected to cowpea weevils but kept throughout the period of experiment. Control 2 comprised of non-treated cowpea seeds subjected to cowpea weevils for a period of 15 days. The treated and control seeds were separately soaked in 50 mL distilled water for six hours; five cowpea seeds were selected at random from each treatment and control, and placed on moist cotton wool (8 cm × 6 cm) in petri dishes with seed interval of 2 cm × 2 cm × 2 cm at temperatures 30°C (night) and 34°C (day). Treatments and controls were triplicated. 20 mL of distilled water was supplied to cowpea seeds up to the fifth day and the content of the petri dishes were observed for seed germination from the first day to the fifth day. Each treatment of unripe banana peel liquid extract was set up in three replicates and analyzed using one way ANOVA. Results from all replicates of the unripe banana peel liquid extract were subjected to probit analysis to determine LC50 and LT50 values. 95% confidence limit was also determined by using IBM SPSS Statistic 20 program (Figures 1-3). 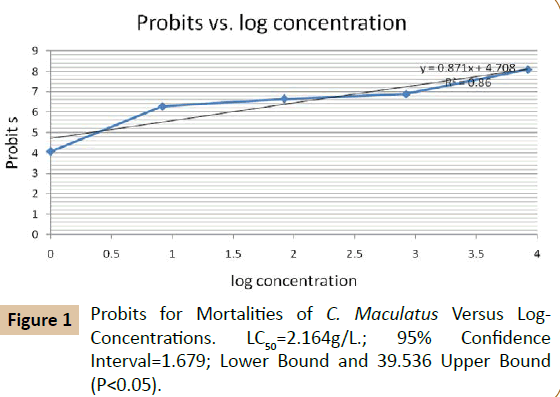 Figure 1 Probits for Mortalities of C. Maculatus Versus Log- Concentrations. LC50=2.164g/L. ; 95% Confidence Interval=1.679; Lower Bound and 39.536 Upper Bound (P<0.05). 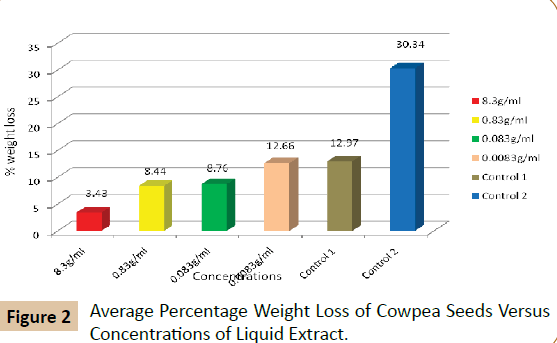 Figure 2 Average Percentage Weight Loss of Cowpea Seeds Versus Concentrations of Liquid Extract. 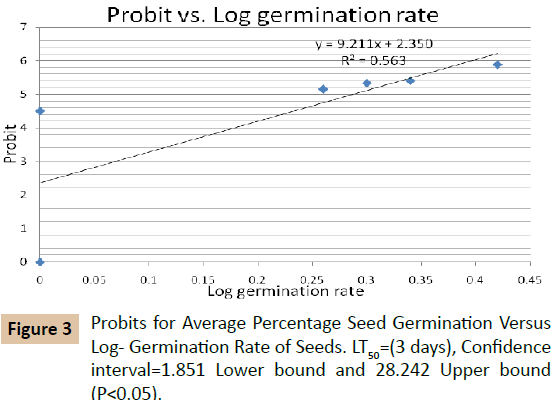 Figure 3 Probits for Average Percentage Seed Germination Versus Log- Germination Rate of Seeds. LT50=(3 days), Confidence interval=1.851 Lower bound and 28.242 Upper bound (P<0.05). pH values for banana peel liquid extract increased as concentrations increased (Table 1). This revealed increased in alkalinity of liquid extract (Table 2). Banana peel liquid extract gave absorbances at wavelengths corresponding to wavelengths of possible compounds; α-thujene, farnesol, citranellal, linalool and menthol (Table 3). These are terpenoids found in essential oils and have been reported to have feeding deterrence, repellency and insecticidal potentials. All cowpea seeds treated with banana peel liquid extract showed significant level of mortality of C. maculatus (P< 0.05) (Table 4). The highest concentration (8.3 g/ml corresponding to 10% w/v) tested induced the highest mortality (Table 5) on day 14, whereas control 2 showed the least with no death on day 1-7 which conformed with the lifespan for the insect reported in literature when reared in the laboratory (Table 3) [6-10]. The effect of liquid extract on mortality of C. maculatus at the different dosages gave LC50=2.164 g/L at 95% confidence interval (lower bound=1.679 and upper bound=39.536). Liquid extract gave appreciable average percentage weight loss when compared to the untreated seeds in control 2. There was a significant level of weight loss among treated and untreated cowpea seeds (P<0.05), treated seeds with the highest concentration (10%w/w) showed the least weight loss (Table 6). Table 1 Organoleptic Features of Unripe Banana Peel Liquid Extract. Table 2 Concentration and pH Values for Banana Peel Extract. Table 3 Absorbances and Wavelengths for Possible Compounds in Unripe Banana Peel Liquid Extract. Table 4 Average Percentage (%) Mortality for C. maculatus. Control 2=Untreated Cowpea Seeds Subjected to Weevil. Table 5 Probits for Mortalities and Log Concentrations. Control 1: Untreated Cowpea Seeds not Subjected To Weevil but Kept in the Same Condition and Duration as Experiments; Control 2: Untreated Cowpea Seed Subjected to Weevil. Table 6 Percentage Weight Loss of Cowpea Seeds at Concentrations of Liquid Extract. With the exception of cowpea seeds treated with the highest concentration (8.3 g/ml, pH=9.48), the control with weevils (control 2) gave the least % germination. This indicated that the control seeds with weevils were fed upon by larvae and hence germination was disfavoured. Seeds treated with the liquid extract at concentrations 0.83 g/mL, 0.083 g/mL and 0.0083 g/ mL (pH=8.93-9.20) favored germination than the control seeds (control 2). Also, unripe banana liquid extract at concentration 8.3 g/mL and pH 9.48 disfavored germination of cowpea seeds (Table 7). There were significant differences in % germination of seeds treated with liquid extracts at 8.3 g/mL, 0.0083 g/mL and the control with weevil (P<0.05) (Table 8). Seeds treated with banana peel liquid extract at 0.0083 g/mL greatly favored germination than untreated seeds not subjected to weevils (control 1), but kept for the same period as treated seeds (Table 9). Table 7 Effects of Unripe Banana Peel Liquid Extract on Percentage Germination of Cowpea Seed. Table 8 Concentration of Liquid Extract, Cowpea Seed Germination Rate and Average Percentage Germination. Table 9 Probits for Average Percentage Seed Germination and Log- Germination Rate of Seeds. Wavelengths of absorbance for unripe banana peel liquid extract corresponded to wavelengths of α-thujene, linalool, farnesol, menthol and citronellal, which are amongst compounds that make up essential oils and have repellency, anti-feedant, antioviposition and insecticidal activities. Results in this study revealed that application of unripe banana (Musa paridisiaca) peel liquid extract to cowpea seeds (V. unguivulata) was effective against cowpea weevils and could be exploited as an alternative to synthetic insecticides for storing cowpea seeds. Also, it should be noted that the concentration of unripe banana peel liquid extract which favored germination of cowpea seeds is 0.0083 g/ml. This research recommends that various concentrations that can inhibits pests could be determined experimentally, so that unripe banana peel liquid extract can be exploited as a cheap and readily available alternative source of botanical insecticides to protect weevils/ insects of other consumable crops. Quinn J (2014) Cowpea: A versatile legume for hot, dry conditions. Retrieved: 24th May, 2015. Ofuya TI, Olutuah OF, Ogunsola OJ (2010) Fumigant toxicity of two Allium species to Callosobruchus maculatus (Fabricius) (Coleoptera: Bruchidae). Chilean Journal of Agricultural Research 70: 510-514. Ileke KD (2012) Bioactivity of Occidentale (L) and Allium Setivum (L) powders and oil extracts against cowpea bruchid, Callosobruchus maculatus (Fab). International journal of Biology 4: 96-103. Malek MA, Wilkins RM (2014) Toxicity of Annona squamosa Linn. Seed oil extract on Tribolium casteneum (Herbst) (Coleoptera: Tenebrionidae). Proceedings of the 6th International Working Conference on Stored Product Protection, Bangledesh, 30th December, 2014. 2: 819-823. Law-Ogbomo KE (2007) Reduction of post harvest loss caused by Callosobruchus maculatus (F) in three varieties of Cowpea treated with plant oils. Journal of Entomology 4: 194-201. Asgar E (2011) Iranian Plant Essential Oil as Sources of Natural Insecticides Agents. International Journal of Biological Chemistry 5: 266-290. Agbogidi OM, Egho EO (2012) Evaluation of eight varieties of cowpea (Vigna unguiculata (L.) Walp) in Asaba agro-ecological environment, Delta State, Nigeria. European Journal of Sustainable Development 1: 303-314. Asawalam EF, Igwe U (2012) Insecticidal potentials of curcuma longa l. rhizomes and citratus leaves extracts against the khapra beetle (trogoderma granarium everts.) (coleoptera dermestidae) on stored groundnut. Agricultural Science Research Journals 2: 534-538. Asawalam EF, Hassanali A (2006) Constituents of the essential oil of Vernonia amygdalina As maize weevil protectants. International journal of Tropical and Subtropical Agroecosystems 6: 95-102. Sha SC, Qi ZL, Shu SD (2013) Chemical Composition and Insecticidal Activity of the Essential Oil of the Aerial Parts of Ostericum grosseserratum (Maxim) Kitag (Umbelliferae). Tropical Journal of Pharmaceutical Research 12: 99-103.